Sumac Ridge has released the latest vintage of two food-friendly whites in time for patio season including the 2014 Pinot Grigio and 2014 Gewürztraminer that are both great value at under $15. It’s ideal timing given that Sumac Ridge will be donating $1 from the purchase of every bottle of wine in the month of May in support of its third year as official wine sponsor for the Ride to Conquer Cancer. It doesn’t matter if the bottle is sold at the winery, from a BC Liquor Store, a private wine shop, or from participating restaurants across B.C. – buying Sumac Ridge in May means making a donation for cancer research. In-store and social media promotions also include an “enter-to-win” contest for a chance to win one of five very handsome customized cruiser bikes. 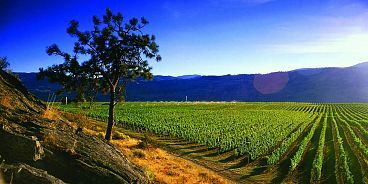 The grapes were sourced from carefully selected Okanagan vineyards from Oliver up through Peachland giving this Pinot Grigio its full spectrum of flavour. The wine gets its slightly darkened colour and enhanced flavour profile from limited skin contact and is fermented in 100 percent stainless steel for ten days at 12 ° Celsius. The result is crisp with a medium-rich texture offering stone orchard fruits like peach and nectarine on the nose. A touch of citrus creates a refreshing finish for this very versatile Pinot Grigio that pairs well with a variety of dishes thanks to the balance of richness and crisp freshness. The grapes for this 2014 Gewurztraminer were primarily sourced from our Whitetail and McIntyre Vineyards in the Okanagan. The aromatics of the Gewürztraminer have been enhanced by adding seven percent Shoenberger to the varietal and the wine was also fermented over ten days in stainless steel at 12 ° Celsius. The resulting wine bursts with aromas of spice and apple, with hints of floral, lychee and grapefruit. The palate contains spice, pear and mandarin oranges, while the mid-palate sweetness rounds with a crisp, lingering finish. Delicious on its own paired with a patio and a view, the 2014 Gewürztraminer is also an ideal complement to spicy Thai fare, zesty seafood dishes and mild blue cheese.